Window treatments serve many functions including controlling the light in a room, blocking warm or cold air from entering or leaving the room, adding privacy, and simply enhancing the style of an area. When you need window treatments in Middletown, DE, make sure you visit our showroom to find the highest quality and most stylish drapes and curtains by leading manufacturers. Whether you’re upgrading the style of your bathroom, kitchen, or any other room, we’re sure to have something to suit your style. If you’re having trouble choosing the perfect bathroom or kitchen window treatments, reach out to our sales and design staff and we'll help you choose your custom blinds, shades, and shutters to match your home’s decor. Any kitchen should feel spacious and airy, and your window coverings can help accomplish that quality. Choose the right kitchen window treatments by visiting our showroom and talking to our staff. Whether you prefer the soft look of sheer drapes or a bright and vivid color scheme with curtains and valances, you’re sure to find what you need at our location. Reach out to our skilled and knowledgeable employees for advice and guidance to the perfect kitchen window treatments for your home. Your bathroom needs to have sufficient privacy to make you and your guests comfortable, but solid blackout curtains can make a room feel tiny and cramped. When you’re choosing your bathroom window treatments, it’s important to balance privacy with the proper use of light. The right combination of sheer and solid curtains and drapes can make even the smallest bathroom feel open and bright, but still private. Make the most of the natural light entering your bathroom by allowing our design specialists to help you choose the right window treatments. In rooms like the bedroom, living room, and dining room, curtains and drapes can be used artfully to make a small room feel more spacious or make an open area feel more comfortable and private. Whether you’re looking for something dark and sophisticated for an elegant dining room or bright and fun curtains for a child’s bedroom or game room, we’re certain to have window treatments to suit every need. 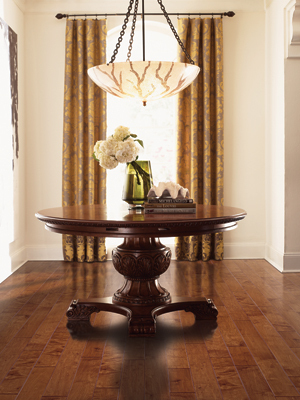 Visit our showroom to peruse our selection of drapes, curtains, and other home furnishings.